Hairpin has a deep connection to Project Bread and Boston's Walk for Hunger. Our own Kristen and Brendan’s dad, Patrick Hughes, founded both over 50 years ago. He was an original: a world-changer, do-gooder and hell-raiser. His commitment to justice, equity and social change inspires us every day. That, and his ability to disarm and delight! He was a savvy storyteller. He moved people and the conversation. He inspired action. He provoked with patience. He spoke to the best in everyone. Patrick died in 1980 at age 41, it was a devastating loss for his family and for the thousands of lives he touched through his fearless belief in the power of love. 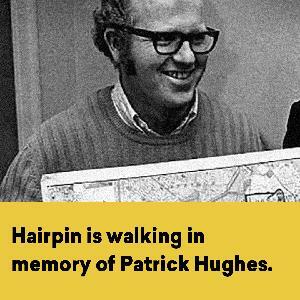 In his honor, Hairpin is participating in Project Bread's Walk for Hunger. We are asking for donations to support programs across Massachusetts that help people access and afford healthy food. Today, hunger still impacts 1 in 10 people in Massachusetts, and in some communities as many as 7 in 10. A donation of $5 or $500 - or anything in between (or more) - will make a difference for the people who rely on these programs. We look forward to walking on May 5 with your support behind us.